Her mysterious smile is the common explanation given for her allure, but is there more to the story? While he stood in the long line at the Louvre, cardiologist Dr. Mandeep Mehra, medical director of the Heart & Vascular Center at Brigham and Women’s Hospital, spotted physical abnormalities in the world’s famous painting. There standing in line he made the diagnosis of severe hypothyroidism. He wrote a paper that was published in September 2018 in the Mayo Clinic Proceedings journal. Take a close look. Let’s zoom in. What do you see? Look closely. A delicate dark veil covers Mona Lisa’s hair. You can see the border of the veil high on her forehead. Do you see the hairline that goes farther back? The eyes without a trace of eyebrows look eerily familiar. When the thyroid gland becomes underactive or even overactive, a variety of skin problems may result. According to researchers, the most common cutaneous signs observed in hypothyroid patients are dry skin, diffuse hair loss, altered skin texture, coarse scalp hair, and puffy face. On the other hand, could it be that Lisa Gherardini purposely plucked her eyebrows and shaved back her hairline as was the hairless fashion rage in the Queen Elizabeth I (1533-1603) era? 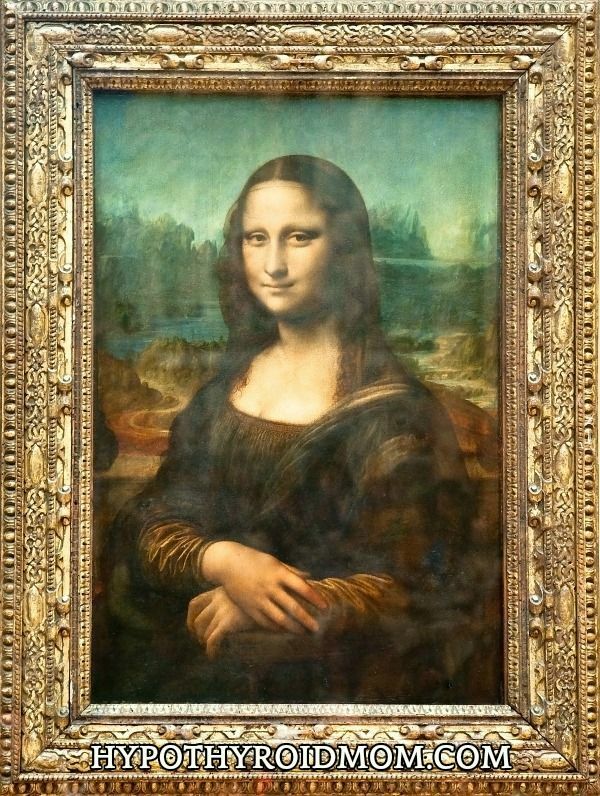 Or, as Parisian engineer Pascal Cotte suggested based on ultra detailed digital scans in 2007, perhaps da Vinci had painted on eyebrows and eyelashes but they simply faded over time or destroyed from years of restoration work. As for her puffy face, let’s not forget that this was created at a time in history when fat was celebrated and big was beautiful. 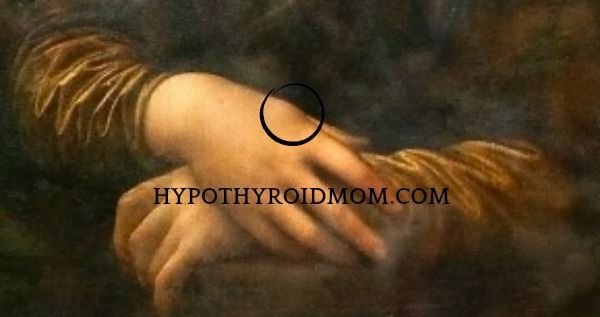 According to the Louvre Museum, “The portrait may have been painted to mark one of two events – either when Francesco del Giocondo and his wife bought their own house in 1503, or when their second son, Andrea, was born in December 1502.” I wonder if Lisa Gherardini had postpartum thyroiditis. If you’ve ever experienced postpartum thyroiditis following the birth of a child, you know the struggle. When the body is deficient in thyroid hormone, the liver poorly converts beta-carotene (that’s what gives carrots their orange color) into vitamin A and the body deposits the excess beta-carotene in the outer layer of the skin, and so the yellowish hue of severe hypothyroidism. Xanthelasma is the medical term given to yellowish deposits of cholesterol found under the skin, most commonly on or around the eyelids. It could also be that the yellowishness of her skin is the result of the fading of paint or accumulation of varnish after centuries of aging. Or perhaps Lisa Gherardini, like Queen Elizabeth I, painted on a white mask (pale skin was the ideal of beauty at that time, after all) on her face, neck, chest, and hands with the popular mixture of white lead and vinegar (imagine a layer of toxic lead over her skin). 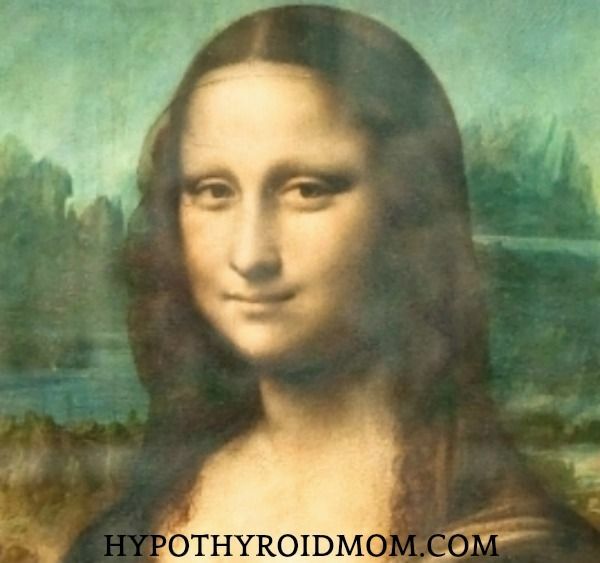 Back in 2004, Mona Lisa was the focus of a study in which researchers reported that her skin findings could be indicative of essential hyperlipidemia, a big word for the common problem of high cholesterol. They indicated that the swelling of the dorsal (back) of the right hand was suggestive of a subcutaneous lipoma. A lipoma is a knot of fatty tissue, a rubbery bulge that can move when pressed, which can occur almost anywhere on the body but most often found on the trunk, shoulders, neck, and armpits. One of the fisk factors for developing a lipoma is high cholesterol. Last, but most definitely not least, her enigmatic smile that has mystified people for centuries. First she is smiling, then she isn’t, and then she is again. Is she smiling or not? 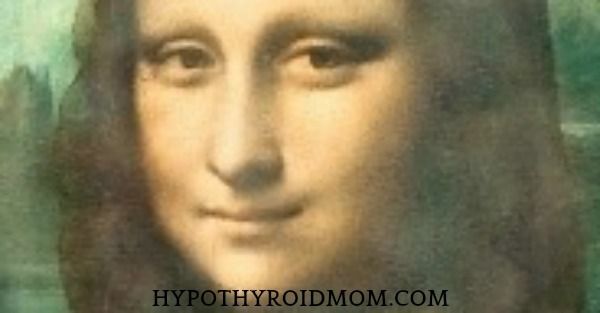 Interestingly Dr. Mehra and his co-author Hilary Campbell wrote, “If Lisa Gherardini was indeed suffering from severe hypothyroidism or its consequences, the mysterious smile may at one level be representative of some psychomotor retardation and muscle weakness leading to a less than fully blossomed smile.” Or I wonder could it be that Leonardo da Vinci picked up on his subject’s depressive symptoms and brilliantly captured it in his painting with a smile that changes in nature? In a study titled A Study of Correlation between Depression and Hypothyroidism in Female Patients, researchers wrote: “It has long been recognized that frank hypothyroidism can cause depressive symptoms and it almost always does so in severe cases.” Or maybe it was a fake smile because she was so sick from hypothyroidism and no one was listening. Sadly, not much has changed for thyroid patients 500 years later. Look at yourself closely, even more closely. Do you see any of these signs? 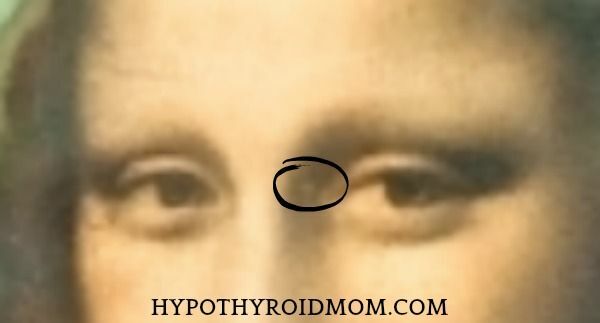 Hypothyroidism may be plain as day staring back at you. Hi Dana, like so many others here, I have begged my Dr over and over to please check my antibodies but she refuses. I am 66 y/o and have dealt with hypothyroidism since I was 20 y/o. Over the years, I too have fluctuated between hypothyroidism and hyperthyroidism and my dosage has constantly been increased and decreased and at this time I’m on the lowest dosage I have even taken and I feel worse than ever. I’ve taken Synthroid since the beginning of my disease (the generic doesn’t work) but about 3 years ago I was able to convince my Dr to let me try Armour because of all the great results I had read about from others but unfortunately it did not work and I was the sickest I had ever been. My question is, if I were diagnosed with Hashimoto what thyroid medication or other medication would I be prescribed? I’m so glad you founded this group. It’s goid to know that there are others that can relate to what I’m experiencing and not think I’m crazy. I love it! Wonderful to have you at Hypothyroid Mom Lakesha. All the best, Dana Trentini (aka Hypothyroid Mom). I have been living with what now adds up to a whopping 100 symptoms of thyroid issues. I was put on synthroid 5 years ago and the symptoms seem to get worse, not better. I went to naturalist physican who is very expensive, for a year now and feel just as awful. I have had more blood work than I can count and I’m told I’m hypo, then hyper, and my levels are okay, back to hypo again. It is different all the time. All I want is a answer, help, a direction. Instead I get no help or answers from doctors. I instead try to sort through the internet with my brain fog that has been present now for years. Family and friends do not understand either. I’m glad I found this group, so I know there are others who will understand. I have another doctor’s appointment at the end of the month with some one new. My hope is that I might get any answers or help. I don’t know where you live but in Temperance, MI there is an amazing doctor by the name of Dr. Woodhouse. I highly recommend him. He’s an MD that uses a naturopathic approach. Other than having me on natural thyroid and Low Dose Naltrexone (which I read about on this website) everything else is vitamins. My life has changed since seeing him. He is a wonderful man, takes all the time in the world to speak to you and I personally don’t find him to be that expensive ($160-200 for the initial visit and than about $130 for follow up visits) he also doesn’t want to see you all the time. He didn’t ask to see me again for 3 months after the initial visit and then 6 months after that. Even if it is pricey, I think to find someone that will actually make you feel like a normal human being again is priceless. I live in Michigan…where is temperance located? My husband was diagnosed and we cannot find a good physician for his hashimotos except at UofM.